Squares, rectangles, circles and more, our ‘Shapes Search’ worksheet for kids will help the little ones get familiar with the different geometric shapes. 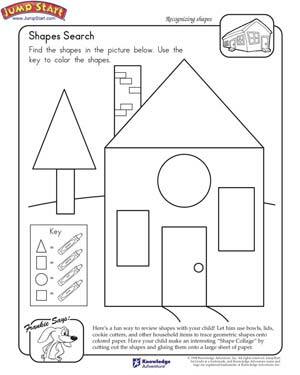 A fun worksheet ideal for 1st graders, the ‘Shapes Search’ worksheet has a large image of a house drawn using various geometric shapes. Kids need to recognize the different shapes and color them according to the key provided.